The trek to Everest Base Camp is without doubt one of the most famous in the world. *Choose a charity to raise money for..
*How would you like to complete your challenge? Working with The British Expedition Company, Life Changing Challenges are now able to offer this amazing Trek!! The trek to Everest Base Camp is without doubt one of the most famous in the world. It takes you into the heart of the Nepalese Himalaya, with awe-inspiring views of many of the world's highest and most beautiful mountains. Our itineraries are carefully designed to ensure you have enough time to acclimatize comfortably, thereby enjoying the trekking experience to the full. You do not need to be extremely fit to undertake the trip as you will be walking at a very slow pace on the mountain to acclimatise to the altitude. This is a porter assisted trek therefore you will only be asked to carry on a small lightweight day pack. Each group is led by a fully qualified National Park Mountain Guide assisted by porters and cooks. During the hotel stay a representative of the trekking company is always on hand for advice, and they are incredibly accommodating, courteous and friendly. Flights depart from Heathrow airport and arrive in Kathmandu where you will be transferred directly to your hotel. You’ll then have a day in Kathmandu to acclimatize and soak up the culture before flying on the Lukla and beginning the trek. The trek itself is amazing giving you a real sense of the scale of the Himalayas and the awesome sight of Mt Everest itself. At the end of the trek you fly back to Kathmandu for a day of rest and then back to the UK. Day 2: Kathmandu. Once you arrive in Kathmandu you’ll be met and transfer s to the hotel. The remained of the day is set aside to explore the vibrant town of Kathmandu and in the evening there will be a group briefing given by the Mountain guide. Day 3: Sightseeing in Kathmandu. We begin the sightseeing tour by our visit to Boudhanath Stupa; a place of worship for the Buddhist, the shrine is one of great importance to the Buddhist religion. Here we shall visit monasteries and watch the monks in prayer. We will continue and make our way to Pashupatinath temple, considered one of the holiest sites dedicated to Lord Shiva. This temple holds great importance as a place of worship to the Hindus. It forms a major part of the people on a day to day basis. Here you can watch devotes offering prayers and watch the activities that are undertaken in the temple premises. The afternoon is free for shopping and leisure. Day 4: Fly to Lukla and Trek to Phakding. Early in the morning we fly from Kathmandu to Lukla (2827m). The flight offers a spectacular view of the Himalayas as we fly parallel to the Himalayan giants bordering Nepal and Tibetan China. After landing we will meet with our porters for the trek. We will have time to explore the village before starting the trail. The trek starts with a descent towards the Dudh Koshi River where we join the main trail to Namche Bazaar. The walking is easy and we will soon reach our lodge at Phakding. 4-5 hours trek. Day 5: Climbing to Namche Bazaar. 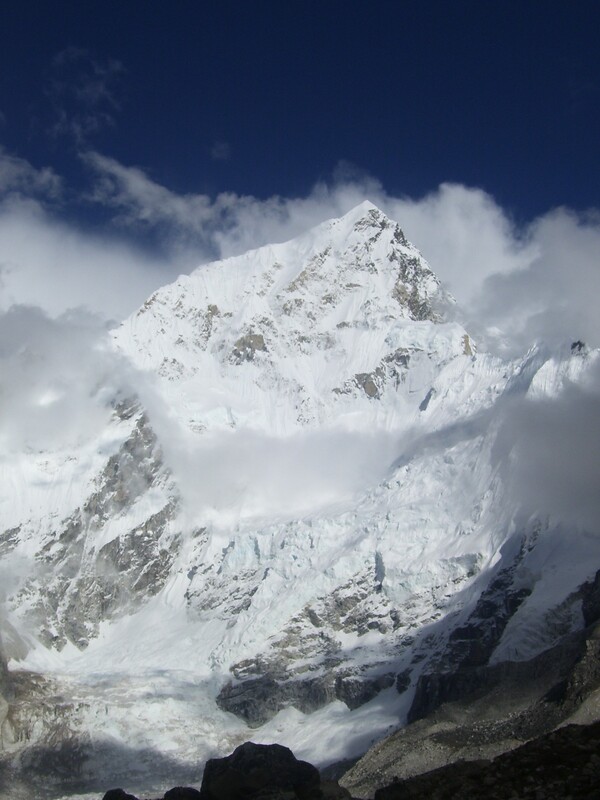 We will ascend slowly on the route to Everest Base Camp. Advancing slowly will ensure acclimatization. We shall tread slowly from Phakding crossing the river to walk through tracts of blue pine and rhododendron forest that is very spectacular in the spring months when the flowers are in bloom. We will cross the Dudh Koshi at Benkar and enjoy great views of the snow peaks Kusum Kangaru and Thamserku. After Monjo the trek will be a little strenuous as it will involve more walking with a steep ascent to Namche Bazaar. From here, it is a short walk to the entrance of the National Park where our permits are checked before we descend quite steeply to Jorsale. The trek continues upstream on a flat terrain to the confluence of the Bhote Koshi and Dudh Koshi rivers. After crossing a large suspension bridge high above the river we climb steeply to the village of Namche Bazaar 3440m. A slow and steady pace is recommended on this section of the climb and we are encouraged to make the most of the fantastic photographic opportunities as the peaks of Everest, Lhotse, Nuptse, Ama Dablam and Taweche come into view. The effects of high altitude will slow down your pace a little, thus we encourage you to advance slowly. In Namche, we move into our lodge in the midst of the village and the rest of the afternoon is free to bargain for artifacts or embrace the spectacular scenery. 6-7 Hours. Day 6: Full day at Namche Bazaar. We will spend a day in Namche Bazaar resting and allowing our bodies to become acclimatized to the altitude of 3,450m. In the morning, there is the option of walking up to the Everest View Hotel 3,900m, returning to Namche for lunch. Day 7: Trek to Tengboche. From Namche, the well-worn Everest trail contours around the side of the valley high above the Dudh Koshi. As we follow the path, we will get our first really good views of the great peaks of the Khumbu: Everest, Lhotse, Nuptse and Ama Dablam. Passing by several villages and numerous tea shops, we will cross the Dudh Koshi River and make a steep climb to Tengboche (3867m), home of an impressive monastery. We have plenty of time to look around Tengboche and in a relaxing lodge. 5-6 hours trek. Day 8: Trek to Dingboche. In the morning we will visit the monastery before descending through forest of birch, fir, juniper and rhododendron. The walking today is uphill yet done very slowly to adjust to the altitude thus pace yourself slowly .After crossing the Imja river the trail heads to the village of Pangboche, backed by the peak of Ama Dablam, where we will take lunch. Later our trail climbs through open alpine hillsides before we re-cross the Imja River and old glacial remains to our lodge in Dingboche 4260m. 6-7 hours trek. Day 9: Dingboche - Acclimatization Day. Before we ascend any higher we will take a day to relax and acclimatize, thus exploring the beautiful Imja Khola Valley. Dingboche is located in a patchwork of small fields enclosed by stone walls protecting the crops. An ascent of the hill behind our lodge will showcase great views of the fifth highest mountain in the world, Makalu, which is not visible from the valley floor. A walk up the valley towards Chukkung is worthwhile. The views are fantastic in this valley; to the north is Lhotse, Island Peak in the centre of the valley, and the crimped ice-walls of unnamed peaks that line the southern end of the valley form a hauntingly beautiful sight. Unfortunately Everest is not visible from the village. Day 10: Trek to Lobuche. Today the walk is relatively tiring up the valley to Lobuche so we advise you take your time and are well hydrated. From Dingboche we ascend the small ridge behind the village above the Pheriche valley. From the top, the peaks of Taweche and Cholatse dramatically line the valley to the west. 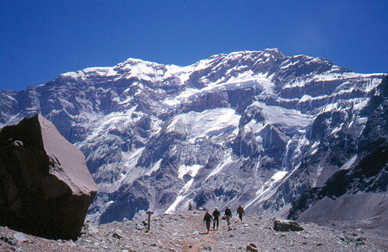 To the north, Lobuje Peak and the snowfields of the Cho La can be seen. Tibet, Changtse are seen at the head of the valley, whilst Everest is hidden behind the towering walls of Nuptse and Lhotse. We then follow the valley stream to our lodge at Lobuje 4930m where we will be arriving early afternoon. 4-5 hours trek. Day 11: Trek to Gorak Shep. After breakfast we follow the broad valley running parallel to the Khumbu glacier. The trail ascends only gradually to the moraines of the Changri Nup Glacier but from here we make a series of small ascents and descents over a rocky trail lined with cairns that leads eventually to Gorak Shep 5200m. After lunch we will set off uphill to Kala Pathar to experience the beautiful sunset views from this amazing point. It will probably take a good hour and a half to reach the summit from Gorak Shep, although lower viewpoints will provide views almost as good. 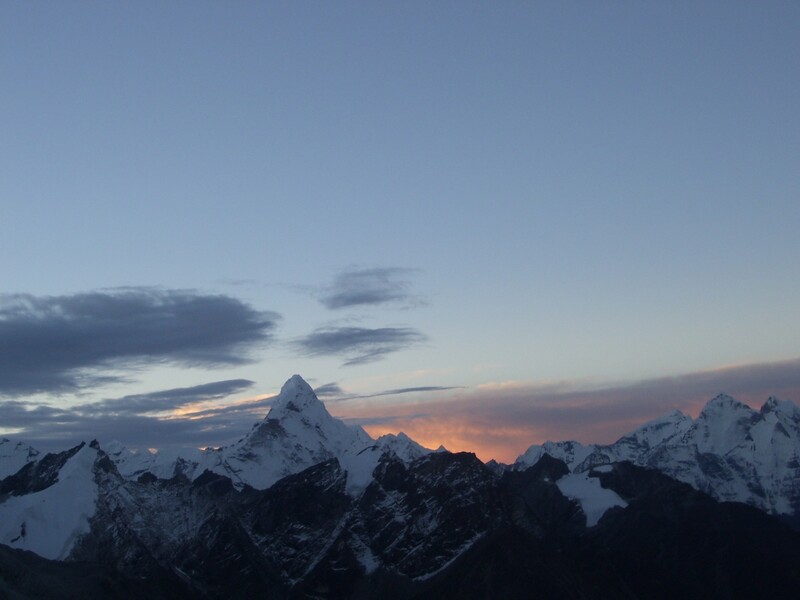 Pumori, Nuptse, Changtse, Ama Dablam, Taweche, Kantega and Everest. As we will be descending in fading light, do take a head-torch for this excursion. 6-7 hours trek. Day 12: Trek to Lobuche. 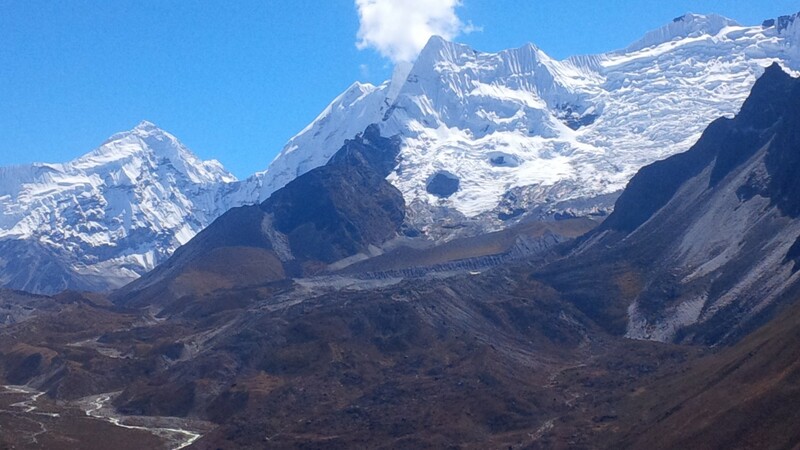 We will advance early to trek along the glacier to Everest Base Camp, which takes around 3 hours. If you are trekking in the popular climbing period of March to May you will almost certainly encounter yaks and porters supplying food and equipment to expeditions here. 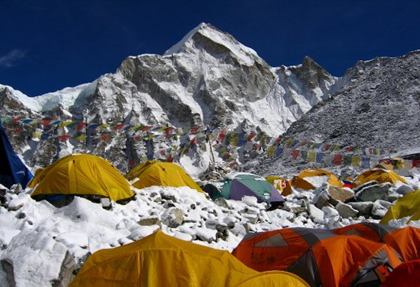 From Base Camp we do not get views of Everest but we will be able to see the notorious Everest Ice Fall which is regarded as the hardest and most dangerous section of the mountain. We return to Gorak Shep for an early lunch before re-tracing our steps to Lobuche. Be prepared for a strenuous day. The trek to Base Camp is optional so if you are feeling tired you can rest at Gorak Shep instead. Day 13: Trek to Tengboche. Following the main Everest trail down the beautifully scenic valley, we pass through Pangboche and climb to the monastery at Tengboche. 7-8 hours trek. Day 14: Trek to Monjo. We continue our trek leading back through Namche Bazaar. We should have enough time in Namche to shop and relax in the bakery with a coffee and a cake, or even to check the Internet. A steep descent for 600m/2,000ft down Namche Hill leads to the suspension bridge crossing the Dudh Koshi River and the small village of Monjo (2,835m/9,300ft). Monjo a quieter place to stay than Namche and it also means our porters have a less strenuous walk back to Lukla the next day. 6-7 hours trek. Day 15: Trek to Lukla. The trail now flattens out and we cross the river twice more before a rising traverse up the hill-side, past numerous tea-houses to Lukla. 3-4 hours trek. Day 16: Fly Lukla to Kathmandu. Early morning take flight to Katmandu. Rest day is free. Day 18: Arrive back at Heathrow Airport. The cost of the trip is £2,350. There is a £250 trip deposit (non-refundable or transferable) to book your place and the remaining balance is paid in small instalments. The price is all inclusive*; covering accommodation, flights, transfers, guides, porters and cooks + all food throughout your expedition. The price also covers the training day. *The only costs not included are VISA’s, travel insurance, tips, lunch and dinner in Kathmandu. The trip payments are structured into manageable instalments so that the full amount doesn’t come as too much of a shock. There is flexibility on these payment dates if arranged in advanced so you can pay larger amounts but less often or we can tailor a payment structure to suit you. To book a place on the trip simply pay deposit online. On advancement of deposit for a booking on any of our trips or expeditions the deposit acknowledges that he/she has read and understands the below booking conditions and agrees to be bound by them. The British Expeditions Company treks are ‘all inclusive’ this means that the cost covers all the accommodation, flights, transfers, guides, porters and cooks, group equipment + all food throughout your expedition. The price also covers the training weekend in the Forest of Dean. The only costs not included are travel insurance, tips, lunch, dinner and drinks in the Kathmandu (this gives you plenty of opportunity to explore the cities and eating out is very inexpensive).